A tent is one of the most important things to pack when going on a camping trip. A tent should be lightweight, easy to carry and easy to set up. The Eureka! Lair 4 person tent is all of these things, and is perfect for youth and Scouters who are looking to enjoy the outdoors. I received a Eureka! Lair tent from Scouts Canada and I was very eager to try it out, so I brought it to my Troop meeting for the Scouts to set up and learn tent skills. The Lair tent was super easy and fast to set up. With only two Scouts setting it up it took less than five minutes! This tent is perfect for cold and rainy nights with a good fly and great material to keep you warm. The fly that goes over the tent also goes over the door at an angle which provides more space to put things you’d like to keep dry, like shoes. The two doors in this tent make it super easy to get in and out of. This tent is designed to fit four people with bags and it certainly did with extra space to spare. We discovered that you could easily fit more people without bags. Taking the tent down was easy and packing it up was a breeze. The bag that it came in was a great size and made getting the tent packed away easy (unlike some other tents I’ve tried). 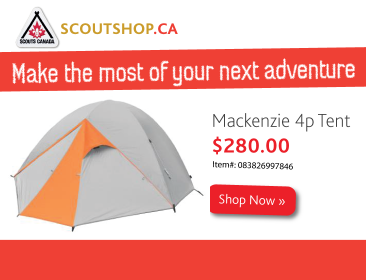 This tent is great for any Scout or Scouter to bring with them on their next outdoor trip and I have no problem recommending it.